After years of not eating green beans, I decided to try something new to get my family to enjoy them. We love bacon in the house so I thought, why not try some green beans with bacon. It was a huge success so much so that we eat green beans with bacon at least once a week as a side dish. Not only was the bacon the secret to success, but the Alpine Fresh french green beans from Costco also make this dish. The french green beans are thinner, cook faster, and are more flavorful then regular green beans. Of course, this is all my opinion, but I believe if you try these green beans with bacon you will agree. You can make this dish with real bacon or even use bacon crumbles, but there is only one brand of bacon crumbles that is good. Yes, it is the Costco brand of Kirkland bacon crumbles. They are high quality, big chunks of bacon crumbles. The best we have found. These green beans with bacon not only taste great, but they are super easy to make especially if you choose to use bacon crumbles. Heat 2-3 tablespoons of olive oil in a wok over medium high heat. Add green beans and garlic, toss in the olive oil, and cover for 8-10 minutes to cook/steam. Continue to stir green beans. Once the green beans are getting softer and brighter in color, you can add the bacon crumbles and seasonings. Continue stirring the green beans and bacon. At this point, you will have to judge when your green beans are ready. It all depends on how you like them. Taste them to see if they are ready. Some like them a little crispier while others like them more done. We’ve cooked them both ways, and the family consensus is they do not like them crispier. I like them both ways. *Note – If you decide to use real bacon, consider not cooking the green beans in the bacon grease so to help keep calories in check. If you don’t care, then go for it! However, I think the bacon adds a ton of flavor even without the grease. It was one of those kind of nights. I didn’t want to do take out and I didn’t want to go to the grocery store. It was time to get creative and pull together a meal with some of the ingredients I had at home. 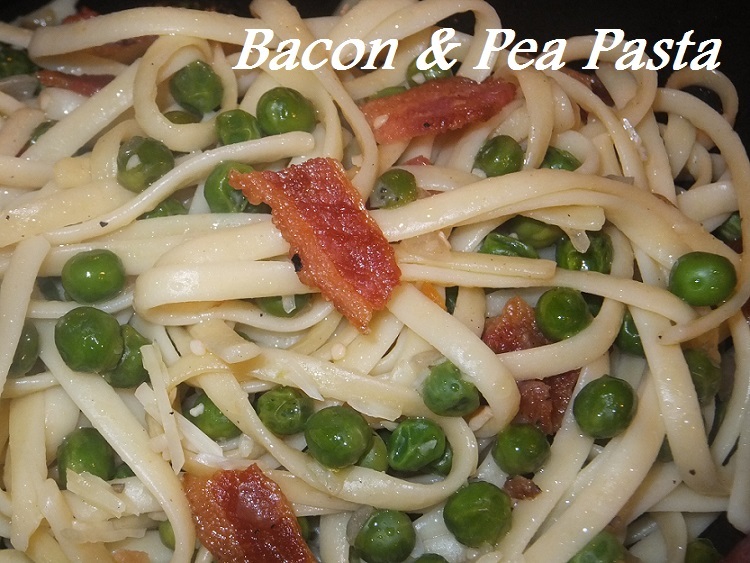 Of course, I picked out some of my favorites – pasta, garlic, peas, and bacon! This meal was so quick and easy and the entire family loved it. It’s a light dish (not low fat), but light and not heavy. You could use any kind of pasta and/or vegetable. Who doesn’t like a dish with bacon in it anyway? While the pasta is cooking, add olive oil to large pan and sauté the onion and garlic. I use a lot of garlic. Add peas to pan and stir. Cook the onion, garlic and peas over medium heat and add salt and pepper as desired. Drain pasta and add to pea mixture on the stove. Lightly toss to coat all of the pasta and pea mixture. Break up bacon pieces and add to pan. Lightly toss bacon into pasta. Serve immediately and add fresh parmesan. Enjoy! This one is a keeper. Avocado‘s are something we have never bought or used at home. I don’t know why. We love guacamole. We eat it in Mexico all the time. We order it out when dining at a Mexican or Southwestern restaurant, but we have never made it at home until now. 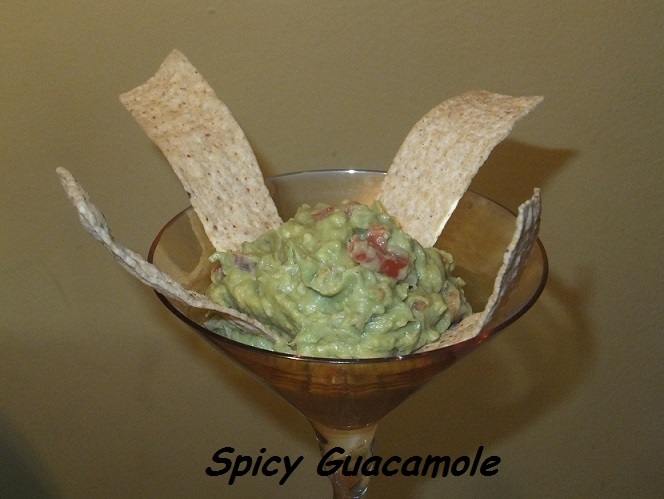 It was so easy and simple to make guacamole. It was so good especially with our fresh cilantro from the garden. I can’t say the kids loved it. They do however prefer guacamole vs. avocados solo. Also, I think back to my childhood. We never ate guacamole or avocados. My first experience with avocados was in my early 20’s when I began to travel for work. It was also when I learned to love so many other different types of food. I grew up in a “meat and potatoes and pasta” kind of family (which was awesome), however we didn’t eat a lot of different kinds of foods. At our house today, we make the kids taste everything. We eat a lot of different types of food. Our kids have quite a sophisticated palate except Nick, the five-year old, but we are working on that! In a large bowl, mash together the avocados, lime juice, and salt. Stir in cilantro, onion, tomatoes, and garlic. Stir in cayenne pepper for desired taste. Refrigerate for 2-3 hours. This is super simple and easy for anyone to make. 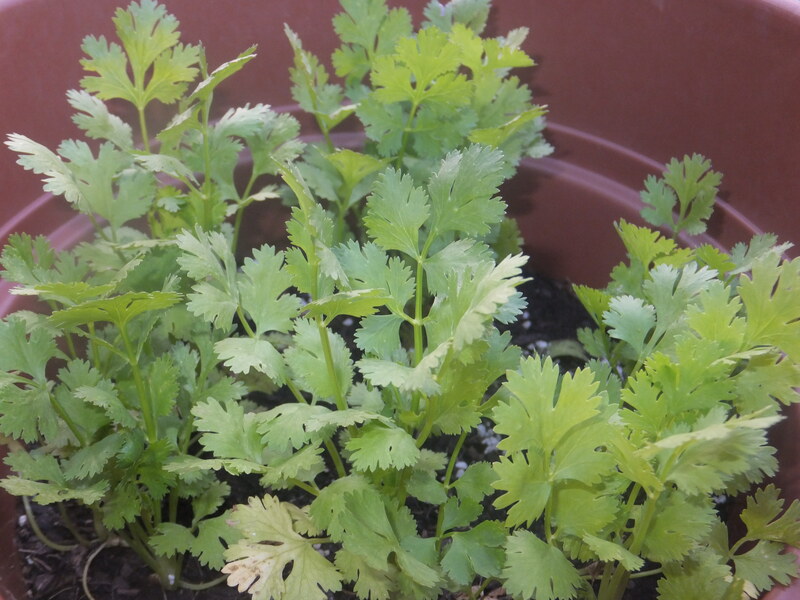 It was our first time eating the fresh cilantro from the garden too. Yummy!